Advanced users of Zotero, the amazing, free bibliography management software, may have run into the problem that you have two separate Zotero databases and want to access them at the same time. I used to manage multiple databases simultaneously by using a really cool Firefox extension: Foxtester. Alas, that extension is no longer working with the latest versions of Firefox, so I had to find another way of running two instances of Firefox simultaneously (this makes it much easier to transfer references between databases). Luckily, built into Firefox is the ability to run multiple instances simultaneously, but it’s a bit trickier to set up (thus this tutorial). First, you need to have Firefox installed, which is generally the case with most versions of Linux. If not, use your software manager or Synaptic to install it. As you can see, I’ve already set up one extra profile (default is the one you normally use), but I’ll set up another to show that it works. You’ll need a name for the new profile. Since I’m using these exclusively to run alternative instances of Zotero, I’m calling them “Zotero1”, “Zotero2”, and “Zotero3”. 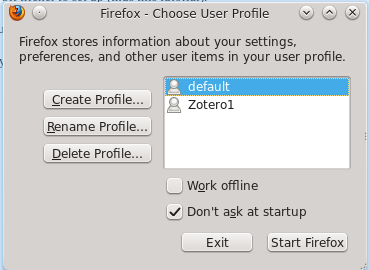 By default, Firefox will create the new profiles in the default folder where it stores the default profile (on Linux machines, this is in: /home/USER/.mozilla (Replace “USER” with your user directory. Also, the “.” before the “mozilla” in the name of that folder makes it a hidden directory; you can view hidden directories in Linux if you tell your file manager to show you those folders.) You can use that location, or choose a different folder. Then select “Finish”. Of course, replace “Zotero1” with whatever you named your profile. The key is the “-no-remote” code which tells Firefox to run a separate instance rather than launch a new window. Go ahead and try it to see that it works. 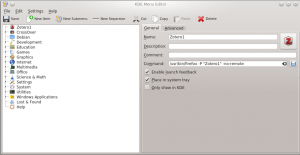 Of course, you’ll need to install Zotero in the new profile if that’s why you want a separate instance running. And if you want to make this even easier to launch in the future, you can add a new application launcher for your alternate profile. 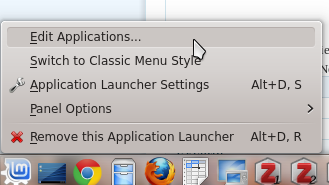 Doing this is window manager specific (e.g., Unity, Gnome, KDE, XFCE, etc.). 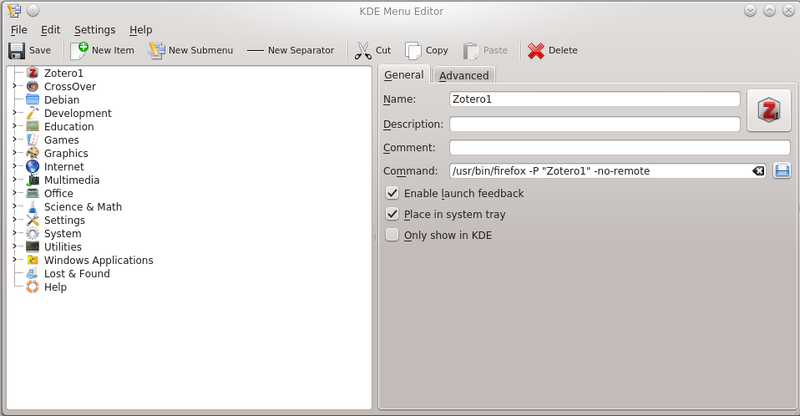 Since I’m running KDE, I’ll show you how to do this in KDE. 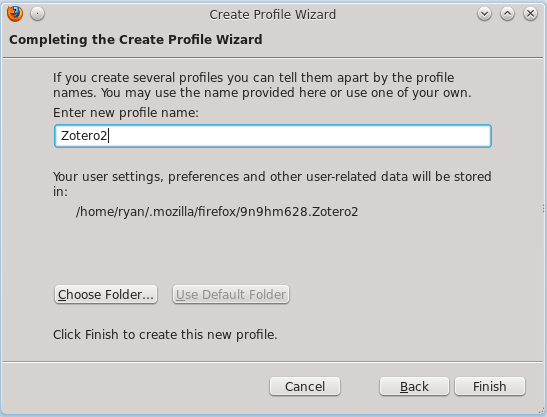 Once you’ve created multiple profiles, this code will simply ask you which profile you want to launch and will launch it as a remote session, so you can have multiple Firefox profiles open at once. afaik that’s not the case on *nix machines. Good to know. That will be a useful caveat for anyone trying this on Windows. If you could confirm please ? If I understand your comment correctly, that should be fine. Basically, the “-P” flag tells Firefox that you want to select a profile. The “-no-remote” flag tells Firefox to open a new session, not a new window of an existing session. If you have one instance of FF running and want to start another, the command you gave would work. You’ll just need to select a profile upon starting that instance of FF.